MURTAUGH – "Good Morning, good morning, good morning! This is Zeb at the Ranch and this morning we are going to discuss how 85 percent of Idaho's economy is generated by agriculture," said Bell, as his voice overpowers the fading strains of Rossini's William Tell Overture fading away in the background on KBAR radio. 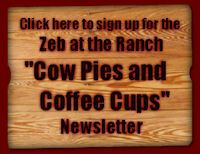 Bell hosts his program, "Zeb at the Ranch," vial local Burley Rupert KBAR radio Monday through Wednesday, 8 to 10 a.m. His unmistakable theme song, better known as "Off to the Races," resonates from radios throughout the Magic Valley area three days each week followed closely by Bell with daily subjects of controversy mostly geared toward farming and ranching. He will discuss with anyone who calls during these hours all subjects including religion and politics but his priority is agriculture-related topics. Bell is cowboy turned commentator. He was born on his dad's quarter horse ranch in Wisconsin. At age 5 he contracted polio shortly after his younger sister became infected with the same disease. After multiple surgeries to correct the debilitating effects of the disease that settled in his legs, his dad bought a Shetland pony for him to ride. This was considered "hippo therapy" that was useful for rehabilitation of polio victims. "Hippo" is the Greek word for horse. The popularity of this therapy is growing today, being more widely used for promoting balance and trunk control and even speech improvement. Those touting this method believe the position of the patient astride the walking horse, moving in rhythm with the horse's gait encourage spontaneous reactions. He found it difficult to stay aboard the critter. A few years later he was injured when another horse fell on him and after recovering, was hit on the kneecap of his bad leg left over from polio, by a line drive off the bat of a friend while playing baseball. After the completion of his education in telecommunications in Wisconsin, Bell read of a job opening at KLIX radio in Twin Falls in 1969. He grabbed a road map and left Minneapolis-St. Paul on Wednesday driving toward a place he'd never heard of and was working as sportscaster at KLIX in Twin Falls Saturday afternoon. He was there until 1972 when he decided to try the rodeo announcing circuit to earn a living. While on a rodeo-related trip, bell and his father-in-law went down in the light plane they were flying. The crash, near Baker, Oregon, killed the pilot and seriously injured Bell and his father-in-law. "Every bone in my body was broken except the one bad leg. God's hand was on me," Bell said. The medical bills were horrendous but he managed to pay them off eventually, according to Bell. Another major medical problem plagued him in 2000, occurring while on a chartered boat trip down the Salmon River. A fall on an oarlock while getting into the boat opened a gash in his shoulder that developed a staff infection, requiring surgery and more than four months to recover. Bell and his wife, Deanne, moved to their ranch in Murtaugh in 1992, establishing a small livestock operation that included some Mexican longhorn Corriente cattle and quarter horses. At that time h traveled widely, announcing at 150 rodeos each year. His schedule now has slowed to less than half that. Today, Bell ropes from his sorrel saddle horse, Chico, for pleasure, undaunted by the physical handicap of one almost useless leg. He still makes the rodeo announcing circuit and defends adamantly the importance of agriculture and believes it is in harmony with the environment. The American consumer enjoys the safest and cheapest food in the world. We must keep ranchers and farmers in business. If we allow farm products from South and Central America to be shipped in, our farmers can't complete," Bell said. "The Endangered Species Act has put our whole agricultural system at risk also, as we saw with the water issue at Klamath Falls, Oregon, last summer – the rush to save endangered species that proved to be unnecessary, made victims of hard working farmers that produce our food." In addition to his radio spot, Bell has a television show called "Straight Talk" each Sunday night at 10:30 on KMVT television. According to Bell the thrust of his show is to make people aware that they need to involve themselves in agricultural issues because agriculture is the engine that drives the economy in Idaho. A second weekly television program, called "Cowboy Country," filmed near the Snake River Canyon and starring musician John Urrutia and Bell is scheduled for release April 1. This program emphasizes the values and beauty of Idaho, with cowboying, bulldogging, rodeoing and some singing. While the media is one good way to get the word out on agriculture, Bell said parents of school-age children should be watchful that school curriculums don't undermine the positive ag message. "Some attitudes taught in our schools come directly from the mouths of animal activists. These people would have us stop rodeoing, stop milking cows, stop raising beef cows and eating meat," Bell said.